For years, C2 Motorsports customers have requested two things to make their performance tuning experience better -- the ability to store multiple engine tunes, and the convenience of not having to ship their ECU for programming. And C2 now has the solution: The C2NER. 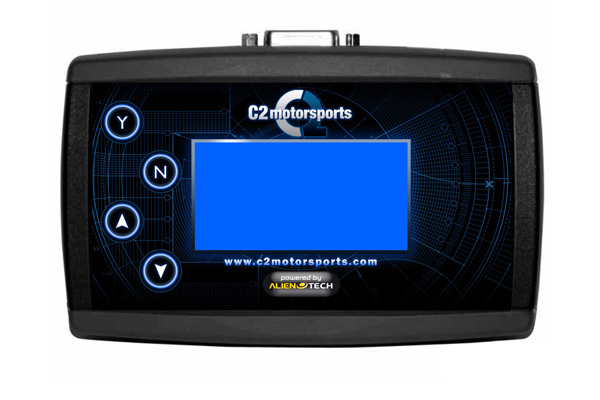 Not only will this programmer provide you with the C2Motorsports tunes you need, it will also deliver them in a convenient, easy-to-use device that will allow you to flash in the comfort of your own driveway or garage as well as on the go. In essence, the power and capabilities of the C2NER are rivaled only by the advantages it provides as a tuning and diagnostic tool. The C2NER Handheld Programmer gives you the capability to find that extra power within your motor, whether it’s naturally aspirated or forced induction, with C2Motorsports Software. From stock motors looking for some extra horses to big turbo or supercharged applications wanting the most from their setup, we have you covered! Through a combination of increased throttle response, optimized Air/Fuel Ratios and improved overall drivability, the C2NER will help you reach your power/torque goals by offering top of the line tunes from C2Motorsports. Easy Installation: The advantage of a handheld programmer is second to none and the C2NER is no different. Featuring a straight-forward design, our handheld programmer makes it effortless to load flashes onto the device from your computer and then it’s as simple as plug-and-play through your OBD2 port to tune your vehicle. No need to send your ECU in, leaving your car out of commission for days, or drive miles away to a dealer; you can do it right in the comfort of your own driveway! With the ability to update or swap tunes with C2Motorsports through email when you need a revision or different tune, the C2NER makes it easier than ever to flash your car with the software YOU want. Not only does the C2NER let you flash your car on the go, it also allows you to diagnose your car with the push of a button! Plugging in your C2NER gives you the capability to read, scan, and clear DTC codes that may be present in your ECU. No longer will you have to take your car to a dealership or spend days trying to find someone with a VAG-Com scanner to diagnose your car. The amount of money the C2NER could potentially save you in gas and service bills alone pays for itself. Flashing and diagnosing your car doesn’t have to be difficult. The C2NER, powered by C2Motorsports software, is here to bring those capabilities to your fingertips AND your garage. For more details about the C2NER, contact C2 Motorsports at (502) 895-3660 (Mon – Fri 8am-5pm EST) or by email at [email protected].